Inside the Dudley House library, Vanessa Zoltan, M.Div. '15 (left), proctor and member of the Board of Freshman Advisers, and Ariana Nedelman, M.Div. 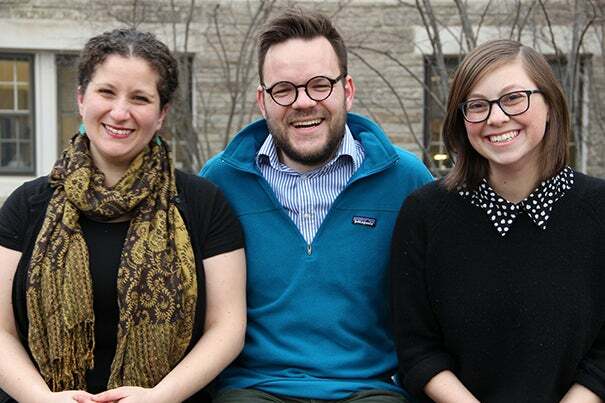 candidate '18, HDS staff member, discuss their new podcast "Harry Potter and the Sacred Text," which looks at the famous books as instructive and inspirational texts. It might sound like a tongue-in-cheek item in The Onion, but a class on reading the Harry Potter books as sacred texts has proven a popular offering for the Humanist Hub at Harvard. Led by Harvard Divinity School graduates Vanessa Zoltan, M.Div. ’15, and Casper ter Kuile, M.P.P. ’16, M.Div. ’16, the class began as a reading group last summer at the Humanist Hub, where Zoltan is an assistant chaplain. It drew nearly 80 participants on its opening night, and is now starting its second year. Recognizing the potential reach of their subject, Zoltan and ter Kuile joined with producer Ariana Nedelman, M.Div. ’18 to put together a podcast. One successful Kickstarter campaign later, the group worked through final exams and wedding plans to produce the podcast, and the series debuted in May. It has since climbed as high as No. 2 on the iTunes top podcasts, and remains atop the religion and spirituality charts. A proctor and student, respectively, Zoltan and Nedelman met with the Gazette in the Yard to talk about creating the podcast, the intricacies of reading a text as sacred, and how they see the future playing out. In the premiere episode of “Harry Potter and the Sacred Text,” Casper and Vanessa talk about why they are starting this project and analyze the first chapter of Harry Potter and the Sorcerer’s Stone through the theme of commitment. GAZETTE: Where did the idea for “Harry Potter and the Sacred Text” come from? So it was his idea to do Harry Potter, and once we started talking he got even more interested in my work. He came to my thesis defense, and we pitched doing Harry Potter as a sacred text as a class to my boss at the Humanist Hub, Greg Epstein, and we started on our adventure together. So the way I like to say it is I liked the books a lot, but I had faith in Casper. NEDELMAN: Before coming to graduate school, I was working for Pemberley Digital, and the phenomenon around “The Lizzie Bennet Diaries” was so interesting to me. Part of that was people were loving “Pride and Prejudice,” and seeing themselves so fully in Elizabeth Bennet and identifying with her. And the most beautiful part of my job was responding to fan mail. We’d get these people writing in telling us how this YouTube series had changed the way they were living in the world, had helped them with their disability or depression or whatever it was. Those moments were actually what inspired me to want to come to [Harvard] Divinity School, and then when I came and heard about “Harry Potter and the Sacred Text” it just zeroed in on everything I was already excited about, about people finding literature as something that could resonate in their lives. GAZETTE: Could this be done with any piece of literature, or does it have to be good literature, or fall in the realm of Joseph Campbell’s hero myth, or something else? NEDELMAN: It really depends on the love. I think it’s dangerous to say that some literature is better than other literature because you end up drawing lines about what is great literature, which makes me uncomfortable. People are already doing this work with Harry Potter, that’s what’s important. Sorting into the houses is an example we always use. That’s part of how people will identify on Tinder, like I’m a Ravenclaw or I’m a Hufflepuff. And it’s not “If I were to be sorted into a Harry Potter house, it would be Ravenclaw,” it’s “I am a Ravenclaw.” And I think that the work of people who are already living through Harry Potter or seeing themselves in relation to Harry Potter in an intimate way is what makes what we do possible. ZOLTAN: But I do think that a text has to be what I call “duly complicated,” and how I define that is the three of us should be able to look at the same sentence and have four different readings; and I do think there is a risk when we treat something unworthy as if it is sacred. I think it’s a fluid definition, and I certainly think that in different contexts different things are sacred. The example I give is that the Bible is considered sacred, but if it was a Bible in a different language and you didn’t know, you might use it as a doorstopper. So we say that “sacred” is an act, not a thing, and I do think the thing matters. Some texts are more worthy and will give you more gifts than others, but I don’t want to be the arbiter of what counts as sacred. But I do think Harry Potter is uniquely qualified for endless amounts of speculation. GAZETTE: What chapters are you most excited and least excited to do? ZOLTAN: I’m most excited and most terrified of doing the chapter at the very end where Harry walks into the woods [to sacrifice himself]. There’s so much potential richness to talk about, and as ministers trained in preaching you want to excavate the deepest possible lesson from the text. It’s about a young boy committing suicide to a lot of people, and then it’s about a young man doing something brave, and it’s also about a young man saying goodbye to his family, and it’s about mortality and the possibility of resurrection in the next life. I think that I’ll be less scared by the time we get there because we’ll have laid so much groundwork in previous chapters and conversations. But I think about that chapter frequently. Whenever I’m walking to something that I’m stressed about, I’ll be like, “Stop and smell the grass, Vanessa.” I think it’s so beautifully written, and his questions are so childlike. I did hospital chaplaincy, and I’ve sat with dying people in their 80s and 90s, and those are the questions that they have, too: “Will it hurt?” “How will it happen?” So the questions feel very innocent and childlike, but they’re eternal questions. She really transcended the story in the beauty of that chapter. I feel like, for that episode, we can just read that chapter aloud. NEDELMAN: I don’t know that there’s a specific chapter, but I know the books get increasingly dark and complicated. Right now this first book has a lot of lightness to it, and I’m just worried about week after week of dealing with these tragedies and how to make it a good experience for people and make sure that we tap into the complexity and richness of those things. GAZETTE: Part of reading a text as sacred means that there cannot be plot holes. For example, you discussed how Hermione lies to the teachers about being saved from the troll, almost for no reason, and you’re not allowed to then say, “Wow, [author] J.K. Rowling really screwed this one up.” You have to find a purpose for it. Are you confident that your interpretations are going to hold up over the next seven books, and how do you think you’re going to grapple with contradictions, if and when they show up? NEDELMAN: I don’t feel like we’re trying to make definitive interpretations of this text. I think it’s really important that we’re modeling the process of interpretation and of reconciling things. It’s important to be seeking what I’ve called perfection in Bible classes before, to believe that everything’s there for a purpose and that it’s there to teach us something. But I don’t think it’s going to be our purpose to look back at previous interpretations and be like, “Is that still true?” Part of the process is reconciling what we thought was true and now what is true and then making that make sense again. ZOLTAN: We’ll get emails about, “You said this in a previous episode, and now you’re saying something else,” but I’m not worried about it either. I had a moment like that with “Jane Eyre.” I don’t remember what it was, and I was like, “How can these both be true?” I felt like there was a mistake in the novel. So I was thinking about it out loud in front of [HDS Susan Shallcross Swartz Professor of the Practice of Christian Studies] Stephanie Paulsell and I was like, “OK, what are we doing here? The novel’s supposed to be perfect,” and she said, “Whoa, whoa, is it supposed to be perfect? I thought it was supposed to be sacred.” That was 2½ years ago, and it’s taken me 2½ years to come up with a remotely adequate answer to that. My mom isn’t perfect, but she’s sacred to me, and she’s a ball of contradictions, and there’s no rhyme or reason. There are a lot of things about her I can count on. She’s almost always going to be sweet and in a good mood — except when she’s not. And when she’s not, it could be for a good reason or it could be because a memory floated up in her head at that moment about something that happened 20 years ago, and I will never know. She’s not perfect, but she’s still sacred. So the books aren’t going to be perfect, but it’s not our job to treat them as if they’re perfect, it’s our job to treat them as if they’re sacred, which means loving them and treating them with rigor and faith and community. But the fun part of that is that in 10 weeks when it turns out we were wrong about how we interpreted something, we’ll have more information, so we’re just going to be rediscovering it. NEDELMAN: I also think we’ve made a commitment not to talk about J.K. Rowling and to take the text as what it is. So I think in saying the text isn’t going to be perfect we’re not saying she screwed up. ZOLTAN: Yeah, there are no mistakes. That’s what makes it sacred. This is where my rule [comes in because] that’s what makes it worthy. The three of us can read it and have different theories as to why Hermione does a given thing. So if there were only one possible interpretation of that, it wouldn’t be worthy of treating as sacred. GAZETTE: So given the continued increase in religious non-affiliation in the United States, do you think this sort of interpretation of art-that-you-love is how we maintain faith, by becoming Beatleists and Potterheads and Whovians, so to speak? NEDELMAN: For me, personally, I do think some kind of spiritual life is important. I believe that there are big questions that, whether in an institutional setting or not, as human beings we have to grapple with. And as people distance themselves from more traditional institutions, we need to give them space to do that. And I do think that can be anywhere as long as you’re willing to treat something in that way, that as long as you’re putting the time in to think about it complexly, to love it, to take riches from it, those places can stand in for traditional religion. ZOLTAN: I do think this is a deeply religious country, and it is a deeply theological country. The deepest theology that I want to rub up against in this country is that we get what we deserve. We believe in Manifest Destiny, and I don’t see that theology going away. We tend to believe that, at least as a meta-narrative, that the victims of natural disasters sort of deserve it because the richer people who work harder and live in the better neighborhoods aren’t as adversely affected. Or that kids from certain neighborhoods don’t deserve a good education. I really think that that comes from a Calvinist, Puritanical cultural history that is still a dominant narrative in this country. I think Americans believe that that is the way that everybody thinks, but I think it’s a uniquely American way to believe. GAZETTE: Have you guys been getting a lot of angry mail? NEDELMAN: We really haven’t! We keep expecting to. ZOLTAN: I got my first hate tweet the other night, and it was so polite. I thought, “That’s it?” We braced ourselves, but we really haven’t. We’ve gotten some like, “I disagree with you.” We’ve been called social justice warriors. NEDELMAN: I think we’re currently still the top podcast in religion and spirituality, which means that we displaced a bunch of evangelical Christian preachers, and I’ve always gotten the impression that evangelicals don’t like Harry Potter. I have a lot of friends who were raised evangelical who were banned from reading it. ZOLTAN: We’ve had some people write in to us about that, that they’ve only been allowed to read it since they left the church. NEDELMAN: But you would think that those people would see Harry Potter on religion and spirituality and think that it was an abomination. GAZETTE: How much of Harvard Divinity School is in each episode or in your process? ZOLTAN: I would say that there are competing voices in my in my head. My family and our history is a big story, that is, a big lens through which I see everything, and then literature and my love for literature is a second, and then the Divinity School is the third lens I see it through. And there are definitely key moments of conversation that come back to me. NEDELMAN: Even if you’re not actively implementing what you learned at the Div School, your experiences in certain classes and thinking about certain things affect the way you think about these topics. So it’s always infusing what you’re thinking about. ZOLTAN: The M.Div. is a very practitioner-oriented degree, and so I feel trained as a chaplain. I don’t feel like my training is done, I’m going to retake “Intro to Ministry Studies” this next semester. I still have mentor relationships with chaplains. I’m still very involved in my training. NEDELMAN: I’m still in the Divinity School, so I get to have that playground to think about what we’re doing. I get to have peers who ask why we’re doing blessings this way, and the institutional support to take a class like “Ministry in the Digital Age,” and to spend a whole class talking about this podcast, so that’s been wonderful. ZOLTAN: The Divinity School’s been so supportive. They’ve written us letters that have made us cry. “Harry Potter and the Sacred Text” is available on iTunes, Stitcher, and SoundCloud. 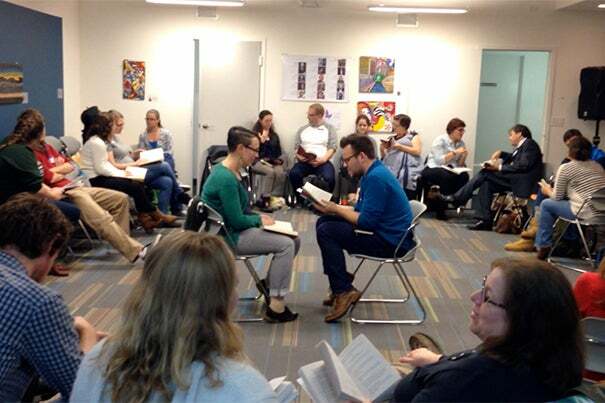 Classes for the reading group at the Humanist Hub start Sept. 14. Visit harrypottersacredtext.com for more information. John Michael Baglione is a writer and author residing in Boston. His work can be found at johnmichaeltxt.com. Filmmaker Oliver Stone discusses his new movie on Edward Snowden with author and journalist Ron Suskind at the JFK, Jr. Forum at the Harvard Kennedy School.